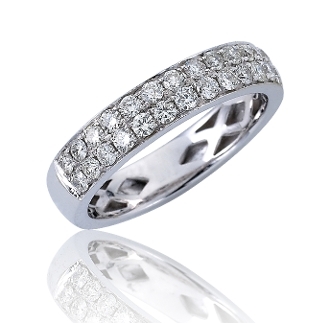 This specially designed Pave Diamond Anniversary-Wedding Ring is set in 14 Karat white gold, with 28 hand-picked dazzling pave set brilliant round-cut Diamonds in two rows creating the perfect gift for that special someone. This ring is immaculately made, finished and polished. The inner band has a unique basket weave design to maximize the fire and brilliance of the 0.75 Carat t.w. in Diamonds, creating security and long lasting wear. For added appeal personalize your item, select our Engrave option and indicate size needed when adding to Cart.